Synopsis: 1183 AD: King Henry II’s three sons all want to inherit the throne, but he won’t commit to a choice. They and his wife variously plot to force him. Did You Know? Peter O’Toole was only the second of (currently) six actors to receive two separate Oscar nominations for playing the same character. His first nominated turn as King Henry II was in Becket in 1964. Quotables: ELEANOR: Of course, he has a knife. He always has a knife. We all have knives. It’s 1183, and we’re barbarians. This film has a most perfect screenplay; Katharine Hepburn has some of the best acerbic one-liners. 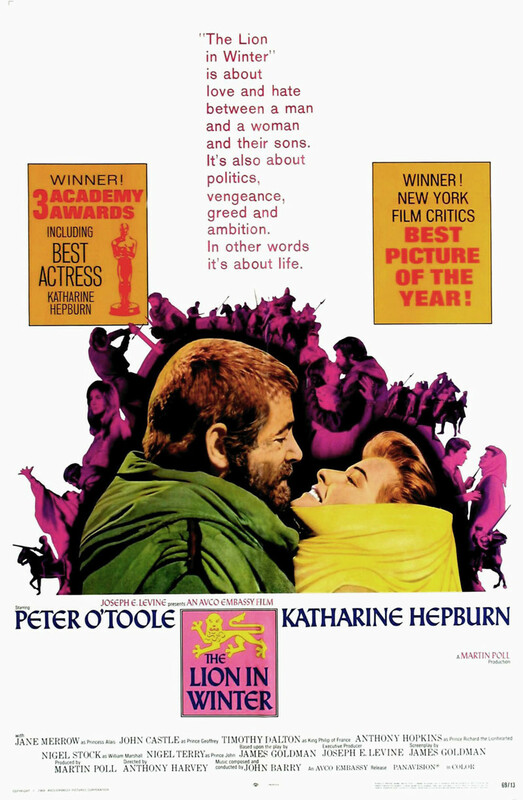 The acting is nothing short of brilliant on all accounts; and I am astounded that Peter O’Toole did not win the Oscar. He is completely unrecognisable, and I am not talking of his physical appearance, but of his character. I don’t think I’ve ever seen an ensemble so seamlessly execute a cavalcade of emotions in a single scene, let alone through an entire film. In today’s cinema, we mark the intensity of a film by its visual effects, or its violent and gory battles, or its sweeping cinematic shots, so the power of the spoken word is often lost. But there is seldom a moment without dialogue in The Lion in Winter, and yet every single second is brimming with passionate ferocity.